زعفران یکی از ارزشمندترین محصولات غذایی و دارویی است که از نظر کشاورزی و اقتصادی در ایران و جهان از اهمیت بالایی برخوردار می‌باشد. امروزه عوامل مخرب محیطی باعث می‌شوند که بدن انسان نتواند با رادیکال‌های آزاد که طی عمل تنفس تولید می‌شوند مبارزه کند. در نتیجه سلول‌های بدن توسط رادیکال‌های آزاد تخریب شده و منجر به پیری زودرس و بیماری‌هایی مانند سرطان و تصلب شرائین می‌شوند. با توجه به محدود بودن کشت زعفران به چند کشور دنیا در زمینه تعیین خواص آنتی‌اکسیدانی گلبرگ زعفران تحقیقات زیادی صورت نگرفته است. این پژوهش جهت بررسی خاصیت آنتی‌اکسیدانی ترکیبات موجود در گلبرگ‌های زعفران و تعیین مقادیر فنل‌های کل و فلاونوئیدها از مزارع کاشت زعفران استان لرستان انجام گرفت. پس از تعیین مزارع کاشت زعفران بروش سیستماتیک تصادفی از گلبرگ‌های زعفران نمونه مرکب (2 کیلوگرم گلبرگ زعفران) تهیه شد. سپس به‌منظور اندازه‌گیری و تعیین میزان خواص آنتی‌اکسیدانی، مقادیر فنل و فلاونوئیدهای کل موجود در عصاره گلبرگ زعفران به‌ترتیب از روش‌های به دام اندازی رادیکال‌های آزاد (روش DPPH)، روش فولین سیوکا و روش رنگ سنجی کلرید آلمینیوم استفاده گردید. نتایج مقایسات میانگین مقادیر IC50 موجود در گلبرگ زعفران مزارع مختلف با آزمون چند دامنه‌ای دانکن نشان‌داد که مقدار IC50 مزارع نورآباد و ویسیان بترتیب با مقادیر 66/1 و 4/156میکروگرم بر میلی‌لیتر دارای بیشترین وکمترین خواص آنتی‌اکسیدانی در مقایسه با سایر مزارع دارا می‌باشند. نتایج مقایسه مقادیر فنل‌ها و فلاونوئیدهای کل موجود در گلبرگ زعفران مزارع با آزمون چند دامنه‌ای دانکن نشان‌داد که مقدار فنل کل با 8/1098میلی‌گرم گالیک اسید بر گرم عصاره هیدروالکلی مربوط به نورآباد و فلاونوئید با مقدار39/41 میلی گرم کوئرستین بر گرم عصاره هیدروالکلی مربوط به چغلوندی بیشترین مقادیر را در مقایسه با سایر مزارع به خود اختصاص دادند. نتایج مقایسه بین مقادیر IC50 به دست آمده از گلبرگ‌های زعفران مزارع مورد بررسی و BHT آنتی‌اکسیدان سنتزی و مصنوعی با آزمون حداقل اختلاف معنی‌داری (LSD) نشان‌داد که کمترین اختلاف به دست آمده متعلق به مزارع خرم آباد و چغلوندی بترتیب با مقادیر اختلاف 40/4 و 38/5 از بین سایر مزارع می‌باشد. Saffron is one of the most valuable food and medicine products that has a high economic importance in Iran and other countries. Harmful environmental factors prohibit the human body from collating the free radicals that are produced during breathing resulting in problems such as premature aging, atherosclerosis and cancer. There has been only a few reported research studies on the antioxidant properties of Saffron petals in world. This research was carried out in order to survey the antioxidant compound that may be extracted from Saffron petals and indicate the total phenol content (TPC) and total flavonoid content (TFC) in the cultivated Saffron farms of the Lorestan province. After specifying the Saffron farms by the Random systematic method, the compound sampling was carried out (Saffron petals amount 2 kg). Then, the antioxidant activity, total amount of phenols and flavonoids in the extracts were measured by methods of DPPH, Folinciocalteau and Colorimetric assay, respectively. The results showed that the amount of IC50 was the lowest and highestin Noorabad and Vician farms with amounts of 1.66 and 156.4μg/ml, respectively by the Duncan test. The results of mean comparison showed that the total phenol content and total flavonoid content of 1098.8 mg Gallic acid/g extract and 41.39 mg cou/g extract, respectively that belonged to the Noorabad and the Chaghalvandi farms had the highest amounts among all of the saffron cultivation in the farms. Brand-Williams, W., Cuvelier, M.E., and Berset, C.1995. Use of free radical method to evaluate antioxidant activity. Lebensm Wiss Technology 28: 25-30. Chang, C.C., Yang, M.H., Wenh. M., and Chern, J. C. 2002.Estimation of total flavonoid content in propolis by two complementary colorimetric methods. Journal of Food and Drug Analysis 10: 178-182. Chen, Y., Zhang, H., Tian, X., Zhao, C., Cai, L., Liu, Y., Jia, L., Yin, H.X., and Chen, C. 2008. Antioxidant potential of crocins and ethanol extracts of Gardenia jasminoides ELLIS and Crocus sativus L. A relationship investigation between antioxidant activity and crocin contents. Food Chemistry 109: 484-492. Chimi, H., Cillard, J., Cillar, P., and Rahmani, M. 1991. The peroxyl and hydroxyl radical scavenging activity of some natural phenolic antioxidant. Journal of the American Oil Chemists Society 68: 307-312. Fernandez, J.A. 2004. Biology, biotechnology and biomedicine of saffron. Recent Research Development of Plant Science 2: 127-159. Gil, M.I., and Kaber, A.A. 2002. Antioxidant capacities, phenolic compounds, Carotenoids and vitamin C contents of nectarine, peach, and plum cultivars from California. Journal of the Agricultural Food Chemistry 50: 4976-4982. Hossein Goli, S.A., Mokhtari, F., and Rahimmalek, M. 2012. Phenolic Compounds and Antioxidant Activity from Saffron (Crocus sativus L.) Petal. Journal of Agricultural Science 4 (10): 175-181. Hosseinzadeh, H., and Younesi, H. 2002. Petal and stigma extracts of Crocus sativus L. have antinociceptive and anti- inflammatory effects in mice. Bio Med Central Pharmacology and Toxicology 2: 1-8. (In Persian). Karimi, E., Oskoueian, E., Hendra, R., and Jaafar, H. 2010. Evalution of Crocus sativus L. stigma phenolic and flavonoid compounds and its antioxidant activity. Journal Molecules 15: 6245-6249. Khademi, K. 2011. Acquaintance about Crocus sativa agriculture. Propagation Publication Agriculture Jihad organization 1 (90): 1-19. (In Persian). Konczak, I., Zabaras, D., Dunstan, M., and Aguas, P. 2010. Antioxidant capacity and phenolic compounds in commercially grown native Australian herbs and spices. Food Chemistry 122: 260-266. Kosar, M., Goger, F., and Baser, K.H.C. 2011. In vitro antioxidant properties and phenolic composition of salvia halophila hedge from turkey. Food Chemistry 129: 374-379. Kowalczyk, A., Biskup, I., and Fecka I. 2012. Total phenolic content and antioxidative properties of commercial tinctures obtained from some lamiaceae plants. Natural Product Communications 12: 1631-1634. Milan, S. 2011. Total Phenolic content, Flavonoid Concentration and Antioxidant activity of Marrubium peregrinum L. extracts. Kargujevac Journal of the Sciences 33: 63-72. Mirheidar, H. 1993. The Use the Plants in Prevention and Treatment of Diseases. Publication Islamic Cultural .535pp. (In Persian). Mokhtari, F., Hossin goli, A., and rahim malek, M. 2012. Evaluation of the possibility in using saffron petals as a source of natural antioxidant. 7th National Congress on Horticultural Sciences Iran. 2581-2584. (In Persian). Murugaian, P., Srikumar, R., and Thangaraj, R. 2009. Isolation and estimation of phytochemical content in aqueous and ethanolic extract of Piper betel. Life Sciences and Bioinformatics 1: 29-31. Norbaek, R., and Kondo, T. 2002. Flower Pigment Composition of Crocus species and cultivars used for a chemotaxonomic investigation. Biochemical Systematic and Ecology Journal 30 (8): 763-791. Omidi, A., Riahinia, N., Montazer Torbati, M., and Behdani, M.A. 2014. Hepatoprotective Effect of Crocus sativus (saffron) petals extract against Acetaminophen toxicity in male wistar rats. Avicenna Journal of Phytomedicine 4 (5): 330–336 . (In Persian). Rafiei, Z., Jafari, M., Aalami, M., and Khamiri, M. 2012. Antioxidant properties of olive leaf extract and its application in sunflower oil. Journal of Food Research 21 (1): 11-21. Schieber, A., stintzing , F.C., and Carle, R. 2001. By- product of plant food processing as a source of functional compounds recent developments. Journal Trends in Food Science and Technology 12 (11): 401-413. Temerdashev, Z.A., Frolova, N.A., and Kolychev, I.A. 2011. Determination of phenolic compounds in medicinal herbs by reversed phase HPLC. Journal of Analytical Chemistry 66 (4): 407-414. Thoo, Y.Y., Liang, J.Y., and Tan, C.P. 2010. Effects of binary solvent extraction system, extraction time and extraction temperature on phenolic antioxidants and antioxidant capacity from mengkudu (Morinda citrifolia). Food Chemistry 120: 290-295. Wojdyło, A., Oszmianski, J., and Czemerys, R. 2007. Antioxidant activity and phenolic compounds in 32 selected herbs. Food Chemistry 105: 940-949. Wong, C., Cheng, K., and Chen, F. 2006. A systematic survey of antioxidant activity of 30 Chinese medicinal plants using the ferric reducing antioxidant power assay. Food Chemistry 97: 705-711. Zargari, A. 1990. 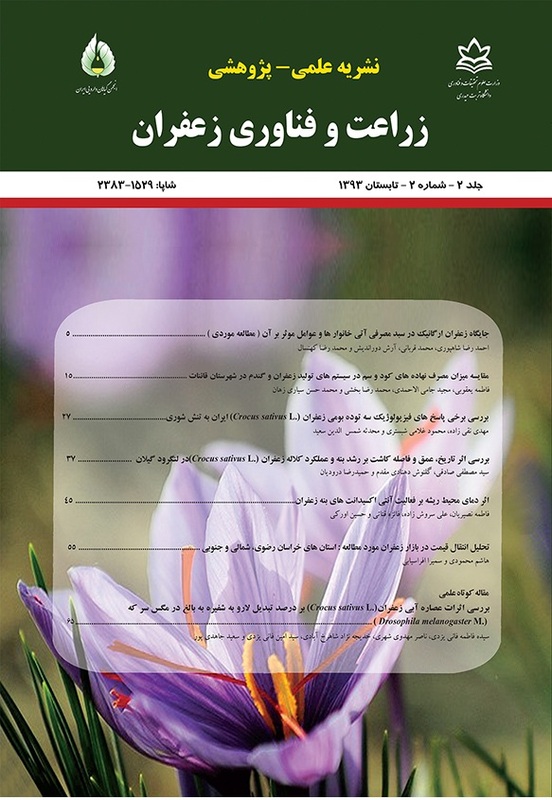 Medicinal Plants 4th edition, Tehran University Publishing. 924pp. (In Persian).